In 1760 cutters must have had a well established form of hull and rigging. The Royal Navy bought at least 31 vessels like that in only 1763, the FLY among them. The FLY's hull lines are kept at the National Maritime Museum in Greenwich. The rig had a deeply roached topsail to bring the jib stay to the mast. The large opening was filled by a short save-all topsail. Cutters were fast, agile ships that could sail closer to the wind than square-riggers. There is more information about the FLY (hull lines and rigging) and cutters in general in David R. MacGregor, Fast Sailing Ships: Their Design and Construction, 1775 - 1875, Naval Inst Pr., 1988, ISBN: 0870218956. The model was made to the description in the book of MacGregor (see above) from Swiss pear. The metal parts are burnished brass. The ropes and rigging were executed to English regulations (as in: James Lees, The Masting and Rigging of English Ships of War 1625 - 1860, Conway Maritime Press, London, Revised Edition 1984, ISBN 0 85177 290 0.). The model clearly shows the lines of hull and rigging that were typical of ships of that age. There are several views of the entire ship model taken from all directions, and several closer views of hull, deck and rigging. Click images to enlarge! 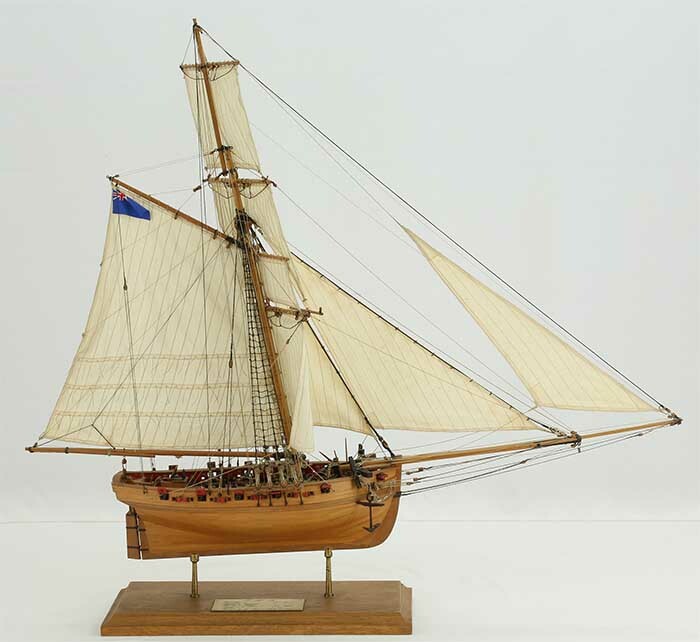 The finely worked ship model was built by Otto Fröhlich, Cologne, Germany, with great care of details. It is 1 : 50 scale. Length is 73 cm, width 35 cm, height 68 cm. The price of the model is 2800 Euro, plus transport cost. Transport: The ship model can be secured in a transport box. This way, delivery by truck or air cargo over long distances can be safely done. If you live close by, picking up the model with your car may be a good way, too. The ship model is available at my showroom in Recklinghausen. Here is information on how to order a ship model and how the transport can be arranged. Please contact me, if you are interested in the ship model. Tel. +49 2361 59757, email: michael.czytko@t-online.de . If you come by car, it is easy to find my home.